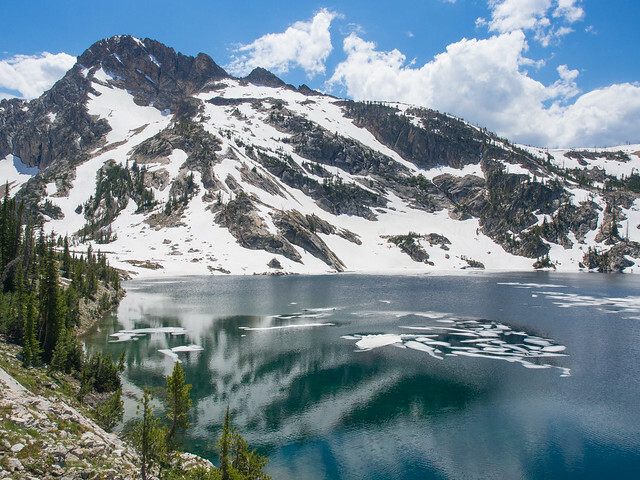 Above: Sawtooth Lake on a late June day. I mean to write updates more frequently, I really do. The past 6 weeks or so have been quite the hectic ride on the work front, however, which has led to a longer gap between posts than I’d like. I’ve spent the better part of the last two months in central Arizona, and I’ll admit I’m a bit burned out on the Southwest after my winter detail to New Mexico and now 5 weeks in the greater Phoenix area. I like visiting the Southwest from time to time, but I’m a lover of green mountains and water at heart, and lately I’ve been daydreaming of the tall trees and salmon-filled streams of the Northwest. It’s awfully easy to long for fog in the trees and an ocean view over a cup of coffee when it’s 113 degrees in the shade, and the greenest thing in sight are the wispy palo verde trees planted everywhere in the seemingly endless suburbia around Phoenix. To add insult to (non) injury, the two times I’ve come back to Boise for days off it’s been record setting heat here, while it’s been cool and rainy when I was gone. On the positive side, I’m pretty well acclimated to the heat now, and that means I pretty much have my neighborhood streets to myself for biking and walking in the mid-mornings and early evenings. It’s been an interesting year so far for travel. Since the New Year I’ve spent more time in hotel rooms than I have in my apartment. At the end of my last work trip, I’ve spent 97 nights on the road for work, and another 7 for family visits outside of work. That’s a lot of time, especially considering that today is the 186th day of the year. I’m anticipating a lot more nights on the road as fire season in the Great Basin, Northern Rockies, and the Northwest begins to heat up… and there’s always California, which will likely burn late in the fall, as it does almost every year. 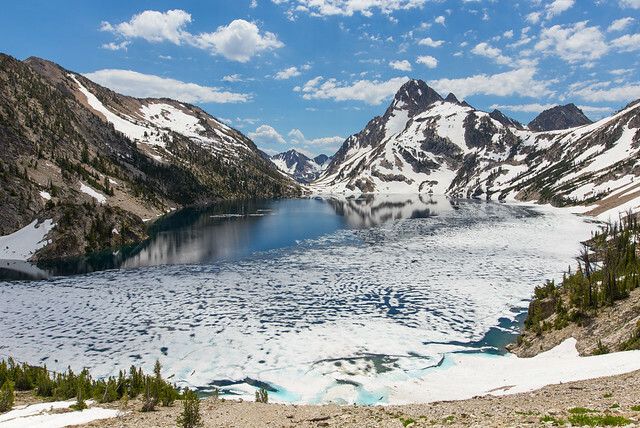 Above: Mount Regan and Sawtooth Lake. It’s not a surprise that after my long stint in the heavily populated Southwest, I made it a priority to head into the backcountry when I got back to Boise, even if it was only for a day. I decided to take an early day hike into Sawtooth Lake near Stanley, mainly because I wasn’t sure what the stream flows were on the other hikes I enjoy, and I’m not a huge fan of fording streams filled to overflowing with snowmelt if I don’t have to. They feel great on hot days in late summer, when the water levels are quite a bit lower, but not so much in late June when the high country is still holding on to the snow left from the depths of winter. And holding on to snow it was, as the upper sections of trail on the shady sides of the slopes still had quite a bit of snow in places. That didn’t stop me from enjoying myself at the top of the hike, in fact it made for a bit of a nice treat when I stashed a water bottle in a shady snowbank for a few hours while I scrambled around the lake being a photographer. It was nice being back in the high country after a winter spent mostly in the urban areas, and I’m hoping to sneak in a few more trips later in the summer and fall if time allows. That’s about all that’s worth updating now… my nice little stretch of time off after a mini-marathon stretch at work comes to an end today, and I’m not sure what the next little bit will bring. In the meantime I’m taking it one step at a time, trying to make the best of the busy season, and hoping it brings me to cooler, greener places than it has so far this year. A guy can dream, right? Not much going on anywhere. Most of my crew is in New Mexico.